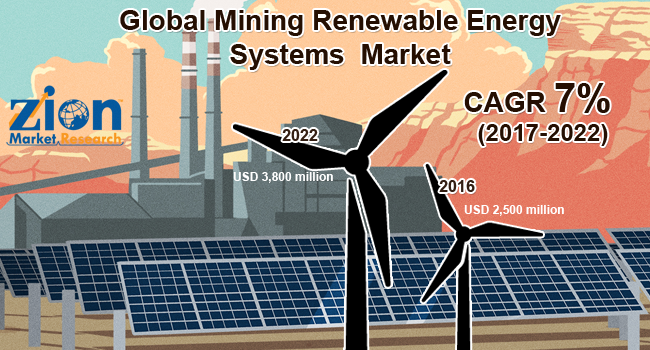 Global mining renewable energy systems market expected to reach USD 3,800 million by 2022 and is exhibit a CAGR of more than 7% between 2017 and 2022. The Asia Pacific is expected to be the most attractive region for mining renewable energy systems market. The Asia Pacific is a crucial supplier of mined products. The region collectively produces over half of the world’s iron ore, more than 70% of copper, nickel, silver, lead, zinc, bauxite and tin, and more than 90% of coal and molybdenum. Mining industry contributes approximately 24% to the total Asia Pacific economies. The governments in the region have been encouraging the adoption of favorable practices in mining in order to promote sustainable growth. The global mining renewable energy systems market report profiles some of the leading players in the market and analyzes their key strategies. The major players in the market are Bluhm Burton Engineering Pty Ltd (BBE), Barrick Gold Corporation, Black & Veatch Holding Company, Cambridge Energy Partners, Conergy, Cronimet Holding GmbH., Downer Group, Enel Green Power, General Electric, Hanwha Group, Juwi AG, Newmont Mining Corporation, Nuance Energy Group, Inc., Pöyry Plc., Siemens AG, SolarReserve, LLC, Vergnet and ViZn Energy Systems amongst others.